Today was the opening of the UGS Innovation Island. 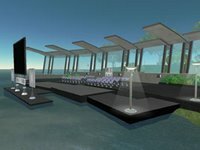 It's been build by the Electric Sheep Company, and in my opinion it's one of the better designs to be found among business sims. It's original and moves away from the traditional office. 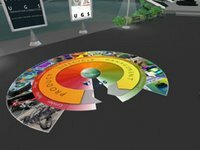 PLANO, Texas - UGS Corp., a leading global provider of product lifecycle management (PLM) software and services, today announced the launch of its UGS Innovation Connection within Second Life®, a 3-D virtual world entirely built by its residents. With today’s launch, UGS becomes the first pure-play PLM company to establish a presence in the mainstream online virtual world. Hendrick Motorsports (HMS) - the only NASCAR® racing organization to win a Cup Series championship for four straight years. HMS, which has been to Victory Lane more than 150 times, builds 750 engines a year and uses NX® software, UGS’ digital product development solution, and Teamcenter® software, UGS’ digital lifecycle management solution, to optimize engine configurations and drill into vehicle data to find information immediately, whether in the office or on the track. HMS’ presence within UGS Innovation Connection will reflect the partnership between UGS and the winning race team and will include Hendrick’s #48 winning car. JCB and the JCB DIESELMAX – a car that, in 2006, achieved a stunning average speed of 350.092 mph (563 kph) to break the land speed record for diesel-powered cars. The new record was achieved using UGS’ NX software to design and develop the groundbreaking JCB444-LSR diesel engine. The winning car used two turbo-charged, high performance versions of the JCB444 engine, underscoring its strength, performance and versatility that was originally created for use in JCB’s construction vehicles. 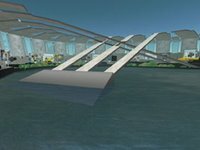 The company’s presence in UGS Innovation Connection within Second Life will exhibit the record-breaking vehicle as well as the diesel engine. The Alloy – a UGS customer and one of the UK’s leading product design consultancies, delivering design and innovation services to companies worldwide. The Alloy is featured within the customer showcase area where residents are able to view Alloy’s Concept Mobile Phone - Polygon - in 3D and learn how UGS® solutions make the design work possible. Moving forward, UGS will host product launch presentations in the Second Life Auditorium. 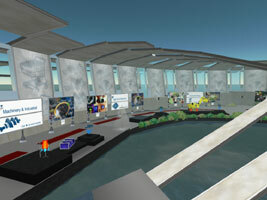 In 2007, UGS plans to launch updates for its NX, Tecnomatix™ and Teamcenter product portfolios.To reach UGS Innovation Connection on Second Life, visit www.ugs.com/secondLife. Okay... I've been too busy to write a story of my own, so it's part of the official press release. For a decent story on UGS read Aleisters' Ambling in Second Life.